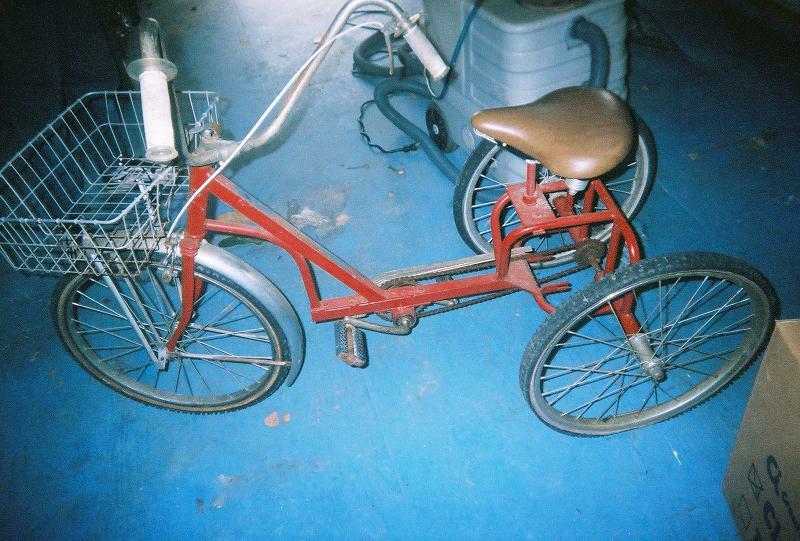 Found this funky trike in Foley, Alabama. It appears to be homemade. 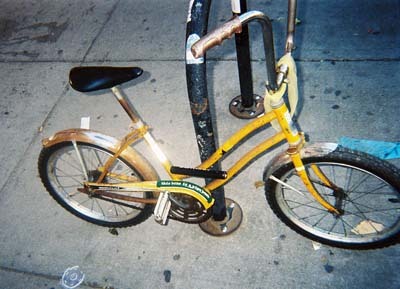 The seat was on a big threaded rod so you spun it to raise or lower it. 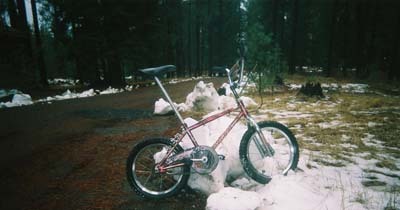 The axle was a solid rod, leading to the skiddiness that the differential was invented to remove. 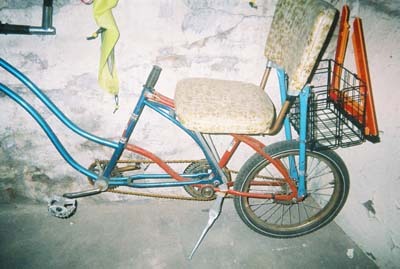 The back chassis appeared to be part of a go-kart frame, and the front was just square steel. 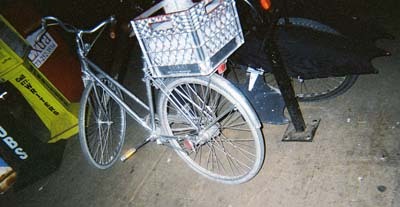 The chain tension was adjusted by unbolting the bottom bracket and sliding it forwards or backwards. With the apehangers and huge seat, this was quite a cruisin' trike. 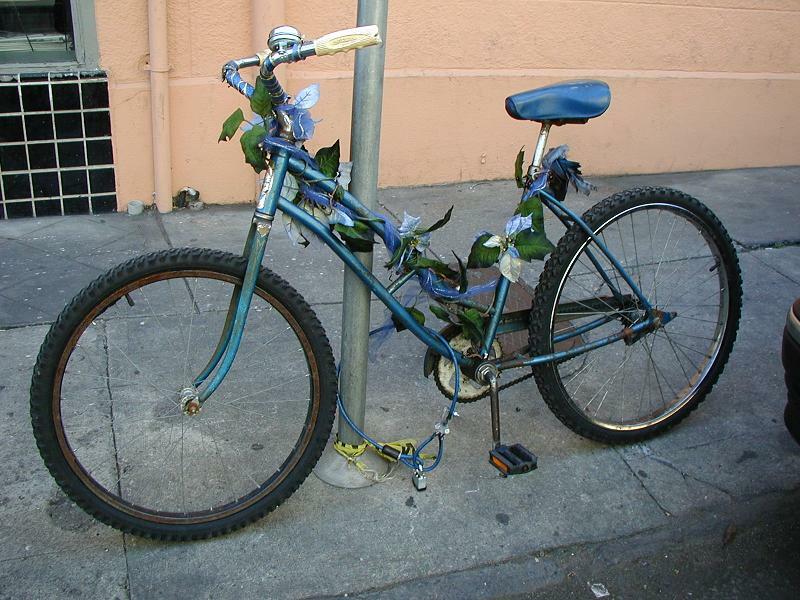 New Orleans seems to be a town of beach cruisers. 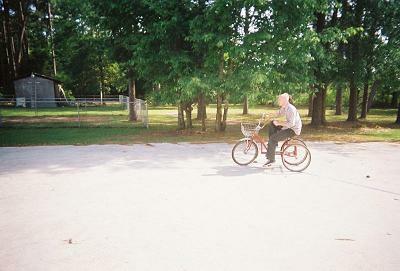 Over 90% of the bikes I saw were beach cruisers and most had a big basket on the front. 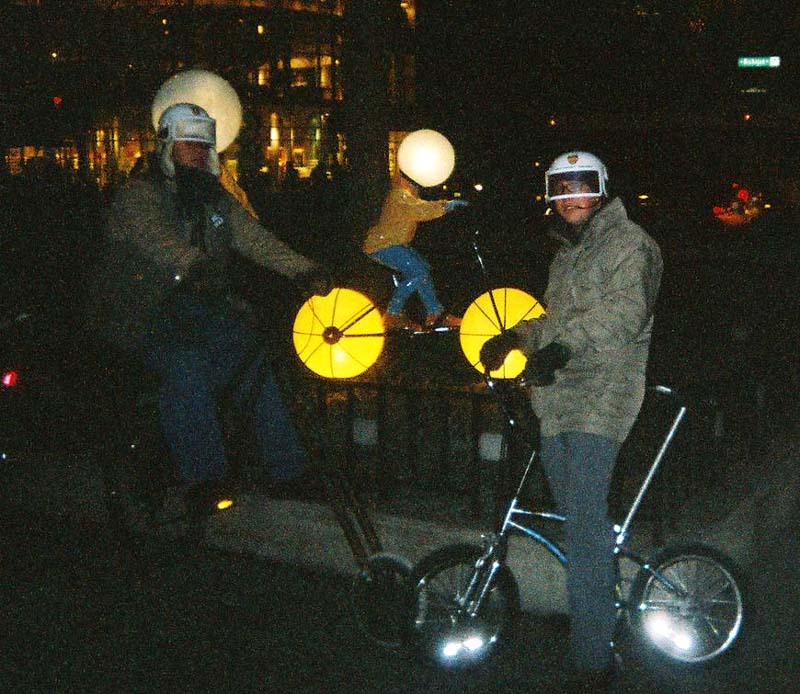 The roving CFB team even came across some choppers, but they were of the store-bought variety. Buying apehangers and nanner seats is a great way to get a start on freakbiking, but here at CFB we look for bikes that are one of a kind due to some creative effort of the owner. 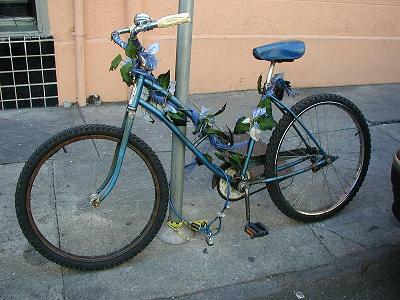 A beautiful flowerdy bike. Notice the little bird perched under the seat. 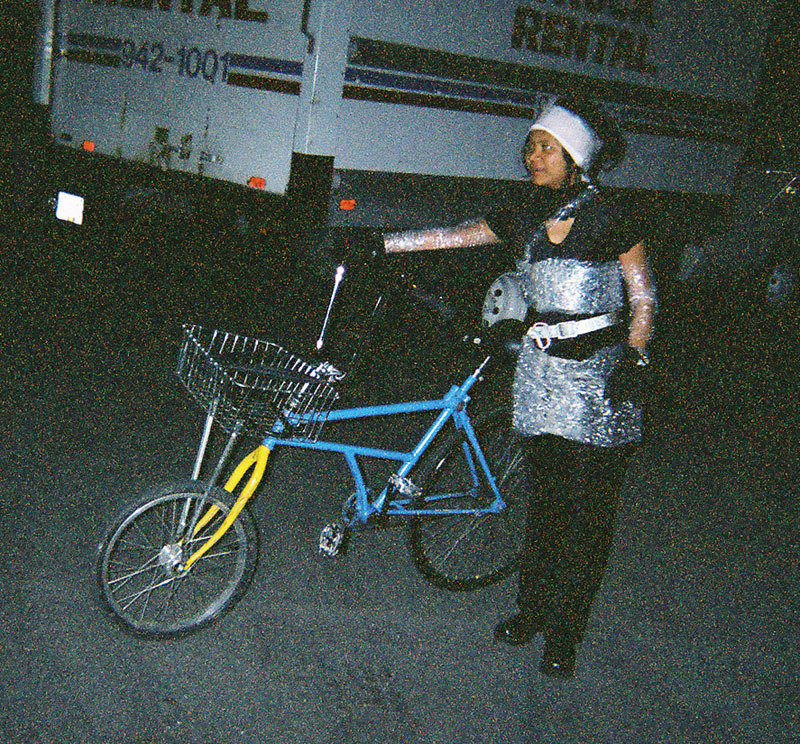 You'll have to zoom in to see this one, but it's got a cool pattern of reflective tape. 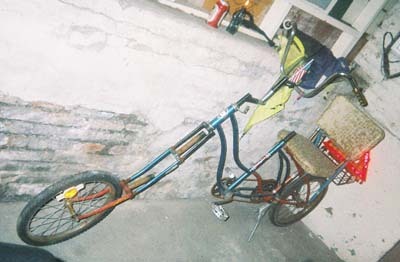 Not a homemade bike but a true beauty nonetheless. The Schwinn Cycle Truck, manufactured as early as the 30s, this is the original chopper... and the original Pack Rat. I can't believe I found one of these, because usually they are used and used and used until they fall apart. A Google image search will reveal plenty of beautifully restored examples... but I don't seek what's been restored and prettified... 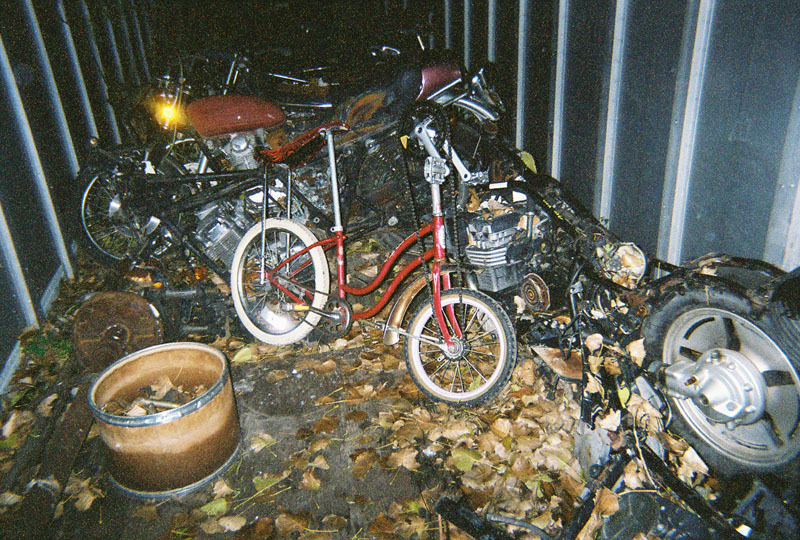 I'm looking for the rusty ole bikes lurking in the back of a storage room, like this one. 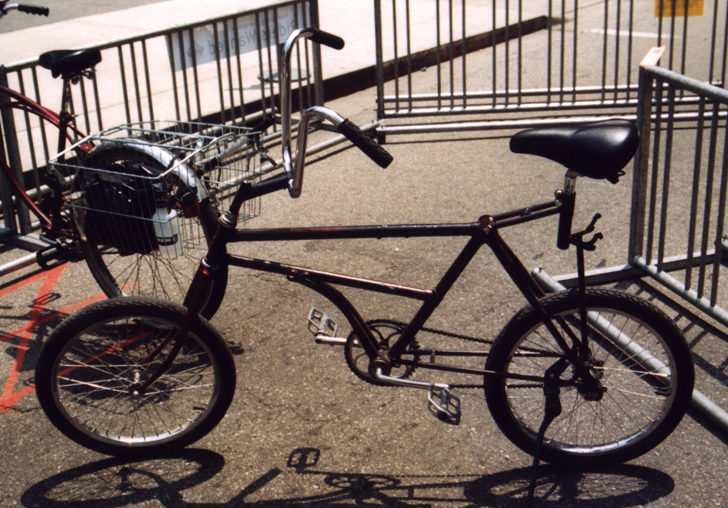 Note how the front wheel is tiny, like on a chopper, to accomodate the large front basket. 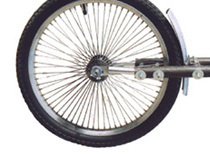 Also, that wee little wheel has spokes with a gauge like a locomotive's. 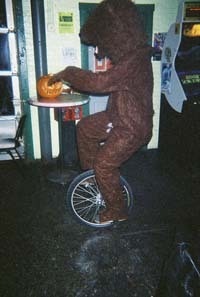 Note that the rear wheel is also some big fat meat. 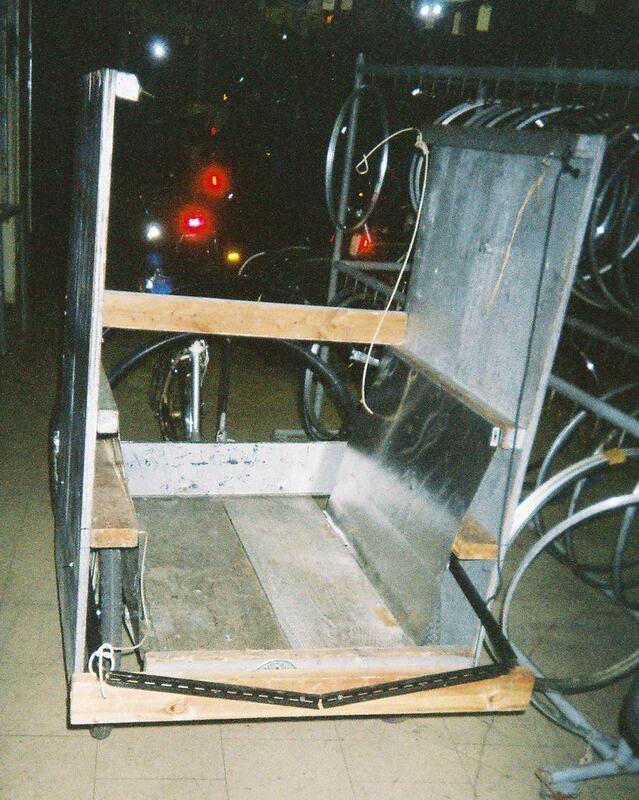 That odd crossbar between the top and down tubes is designed to add structural support to the basket itself... because the weight is suspended from the frame, not the front wheel! Your traditional front rack supports itself on the axle, which means the load swings back and forth as you steer- making for a very squirrelly ride! I believe these bikes were made as late as the 70s, but this one is obviously very old. Here you can see the bracket that holds the rack a lot better. 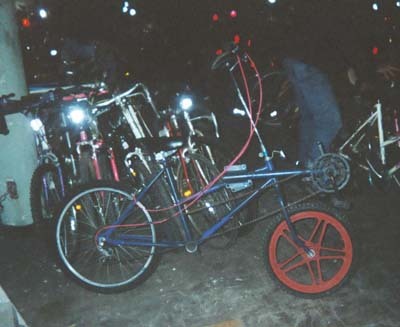 This bike is also missing its huge kickstand, which straddled the front wheel like a square halo and swung down to lift it off the ground, providing a stand that would support the entire load. Just think- a chopper that can haul cargo! What greater merging of style and function could there be? I saw this bike at a Critical Mass, forgot to take a picture of it, and then happened upon it again at its home shop. Another work of art by UV, a tallbike of almost-professional quality. I hear he's got another one on the way that's even sharper. Chain tension on this bike used to be maintained by a chainring just sitting there, held in by the chain itself. The author. In the background is the now-extinct Choppasaurus Wrecks. 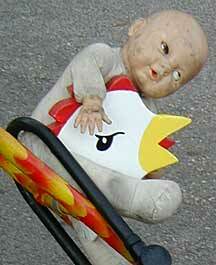 Ah, the chicken chopper, the flagship of the Rat Patrol fleet. Forged alongside the Patrol itself. 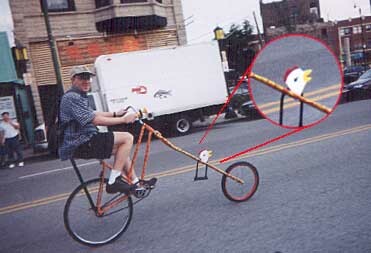 Apparently, when the chicken-feather paint job was being applied via the illegal use of spraypaint within the city limits, a passing cop complimented the craftsmanship. 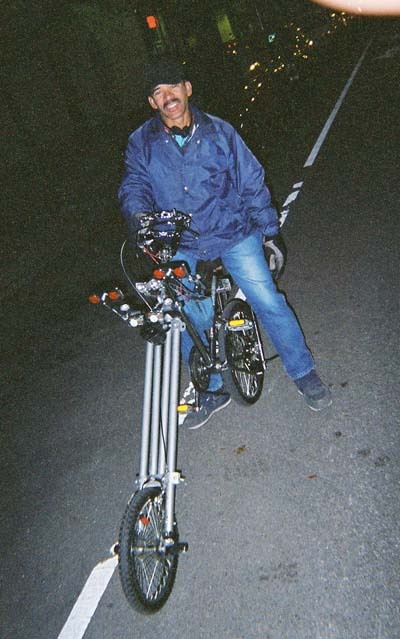 Folks have been telling me there's a tallbike up on the north side, up around Wilson. I saw this bike while out hunting for it. 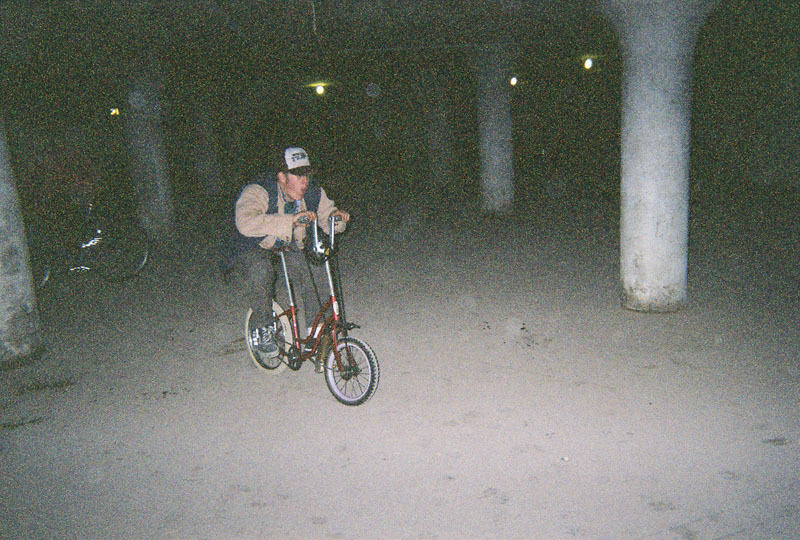 I include it here because who am I to judge what is a freakbike? 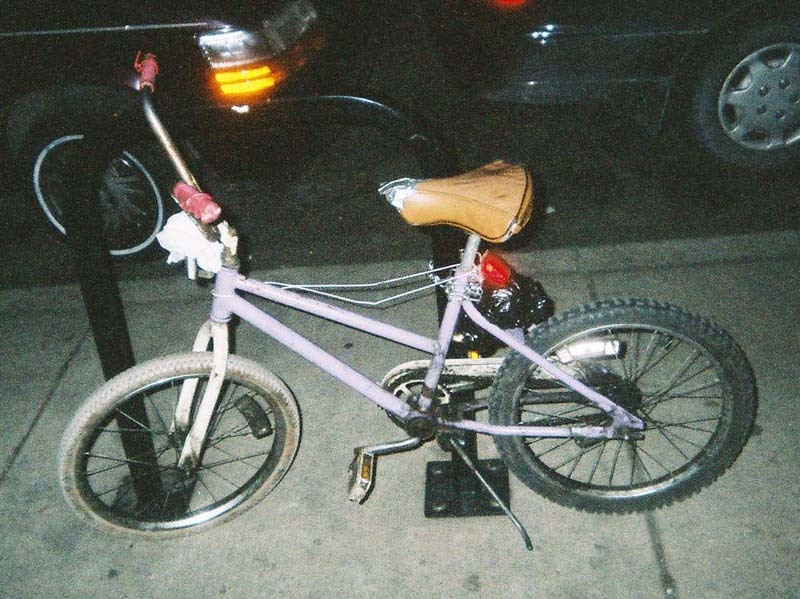 This little beauty has obviously been cobbled together from at least four other bikes. I only wish I knew what the wire hanger was for. 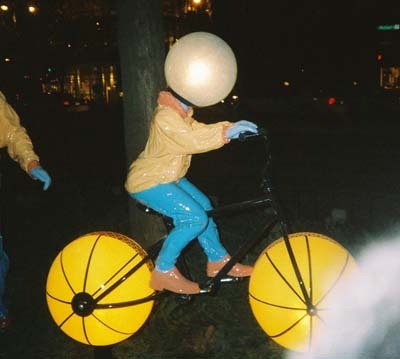 Some globe-headed kid on his glowbike. This thing looks just like the Ice Prowler, that bike some admirable wacko is trying to ride to the south pole. 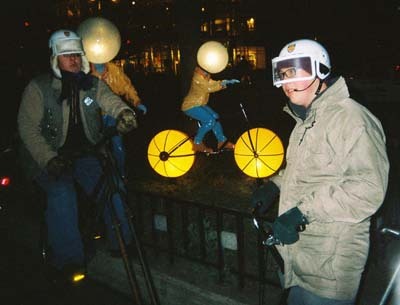 The Rat Patrol was out en force that night, wearing their official patrol helmets. That's Akira Kurachoppa on the left and The Hammer on the right. 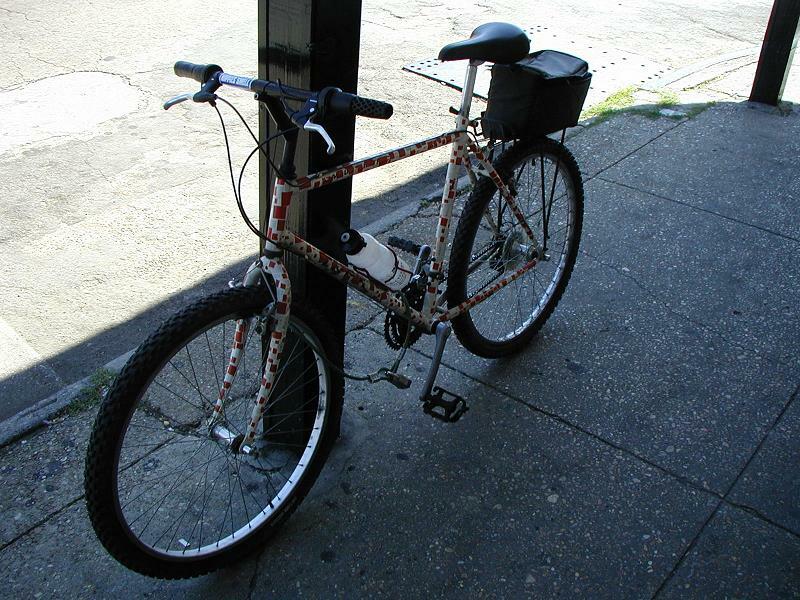 While this funnybike sports the Rat Patrol sticker, its owner apparently is not a member of the Rat Patrol. But he should be. Of course, I say that about all the bikes featured here. I think this bike is called Mightybike, or MiniMighty. 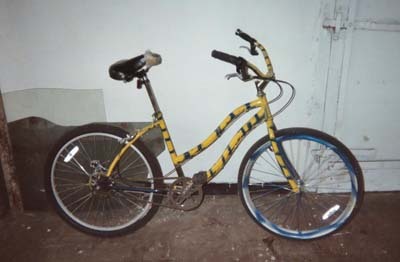 Its most notable feature is the two-speed kickback hub. To shift you pedal backwards briefly. Multiple speeds are a very useful, yet rare, feature on a funnybike. I was taking a little vacation, staying with my brother at the Northwestern Service Academy in Trout Lake, WA. 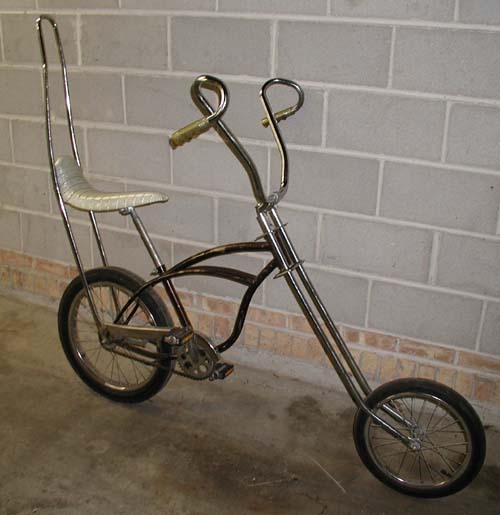 We were so far up in the hills that there was no TV reception, yet lo and behold I learn that they use this little beaut to scoot around the campus. I was surprised to find that the wide-band chunkulation field extended this far from Portland, a good 80 miles up in the mountains. 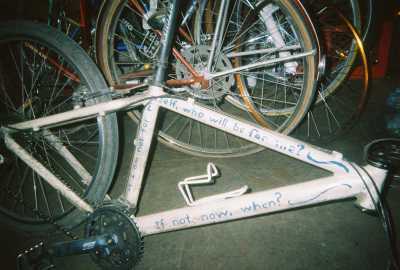 I rode this bike at a Critical Mass, when its owner gave The Hammer a try. Then, months later, it turned up at Working Bikes. 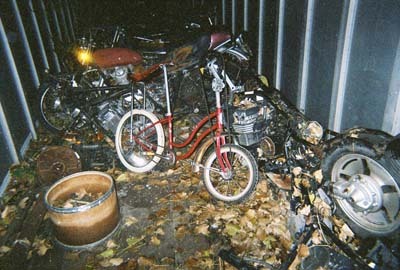 Most of the bikes there come from the scrapyard, where they're bought from scrappers. So this bike must have been cast away, picked up, sold off, and then brought back to Lee's place since the day I rode it. Nice paint job though. I hope someone adopts it. Here are two kustoms I ran into. 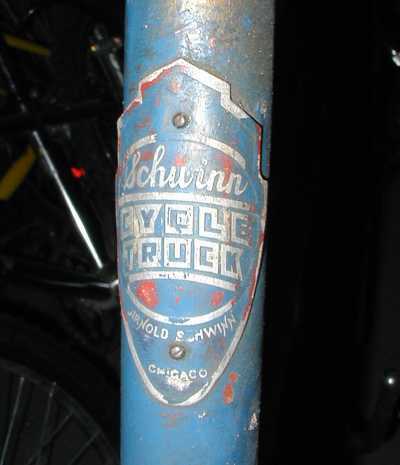 I posted them because I think they're a great example of the work that Barnard's Schwinn Cyclery does. In addition to supporting the Schwinn restoration community, they build all kinds of kustom bikes like these and sell them. 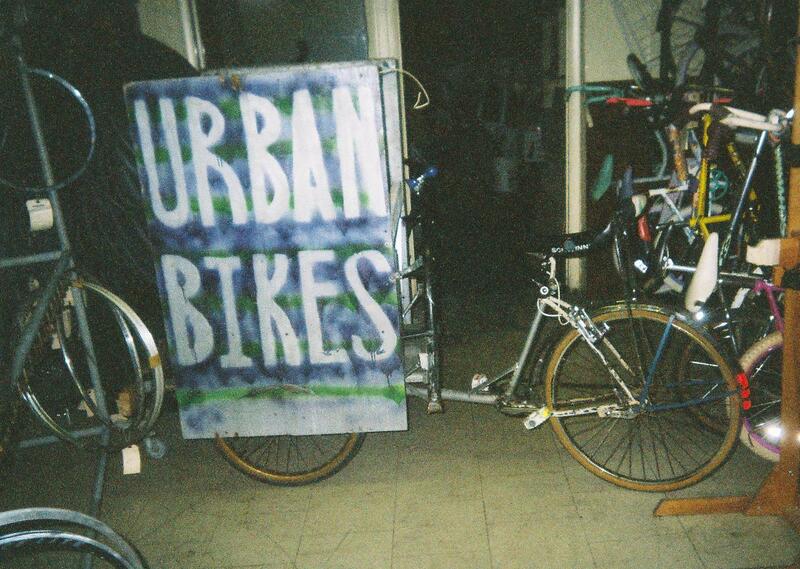 If you want a Runt Bike, a cool beach cruiser, a trike, a re-pop Krate, or a tricked-out Phatcycle, this is the place to go. They're also trash-bike friendly, as once I took a chopper in there and one of the guys behind the counter said he still had the chopper he'd made as a teenager two decades ago. While selling pre-made freakbikes is a great way to a) get people more interested in freaky bikes and b) get more freaky bikes out there, I just don't understand the point of purchasing a pre-freaked bike. The guy on the black bike said he'd purchased both of these bikes complete and added things like lights and bells. They're sweet bikes, but a little like a Russian mail-order bride- bought, not earned. Hopefully this guy and his buddy will be encouraged to make their next bikes into something the world's never seen. 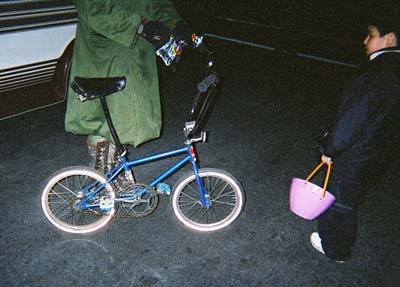 Despite the fact that I am the world's lousiest photographer, you might be able to see the angel bike in this picture. I never talked to the owner, but I think it looks like an angel. The entire bike is spray-painted silver (including the tires- I love it!) and the details are done in gold. Sitting there next to Count Chopula, it reminds me of some sort of metallic holy warrior sent to earth to battle the dark demon bikes from hell. I see this one around a lot so next time I see it in the daytime I'll get a better picture. 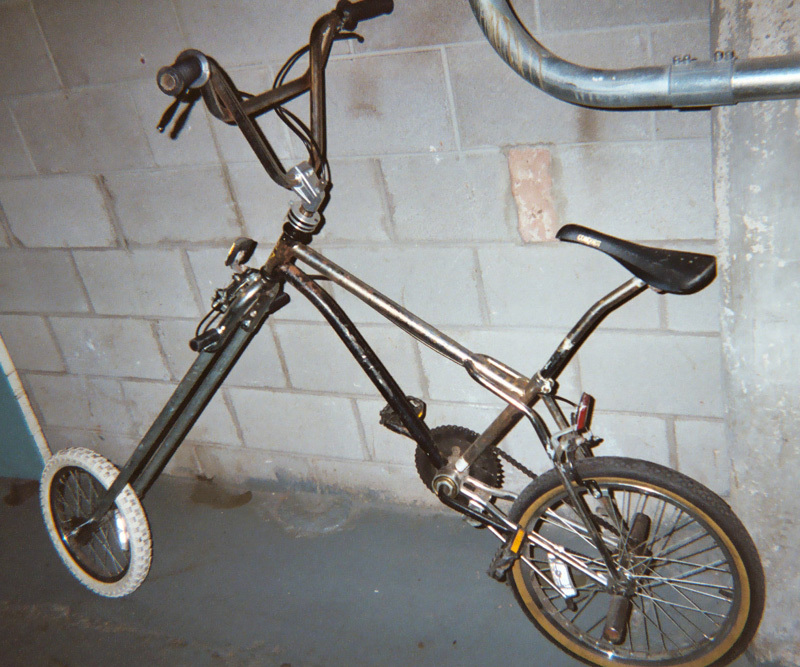 Another random chopper off the street. 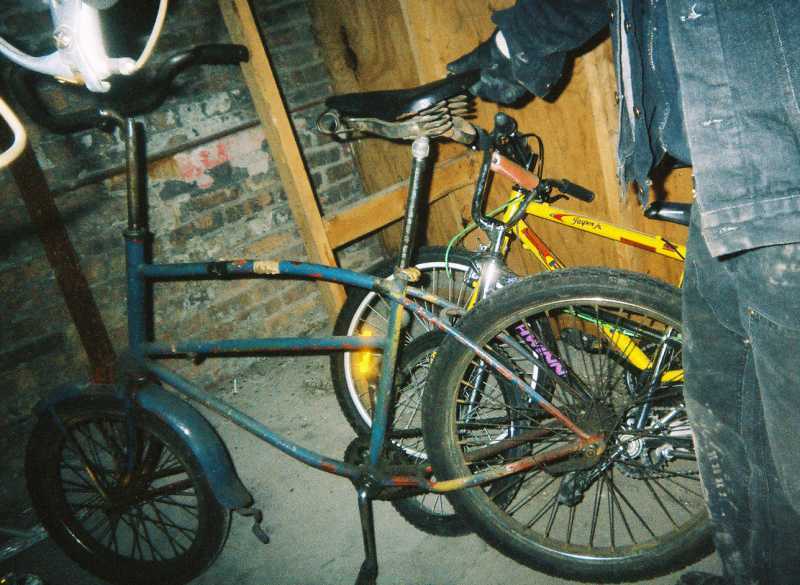 I suspect this one was either made by or directly copied from UV of Blackstone Bicycle Works, one of the most productive and skilled freakbikers in Chicago. 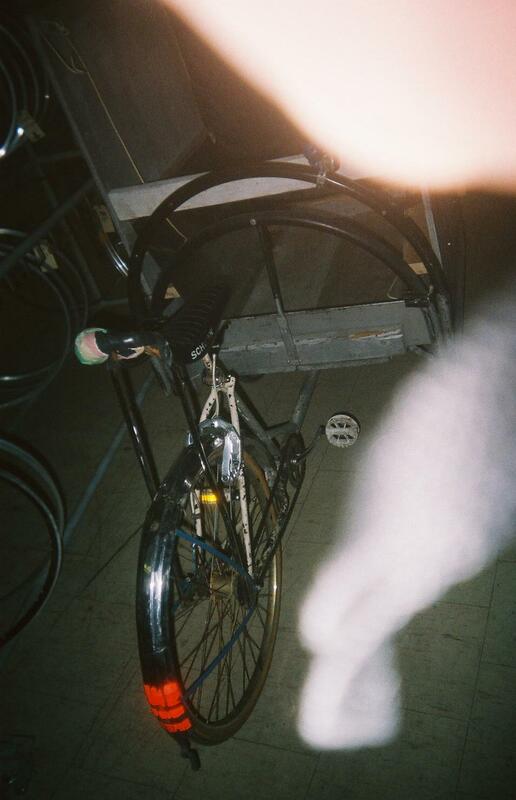 The frame is a flipped step-through frame, with an extra crankset welded where the seat was, with the distinct use of forks as braces for it. Flipping the frame increases the rake of the head tube for extra chopposity. 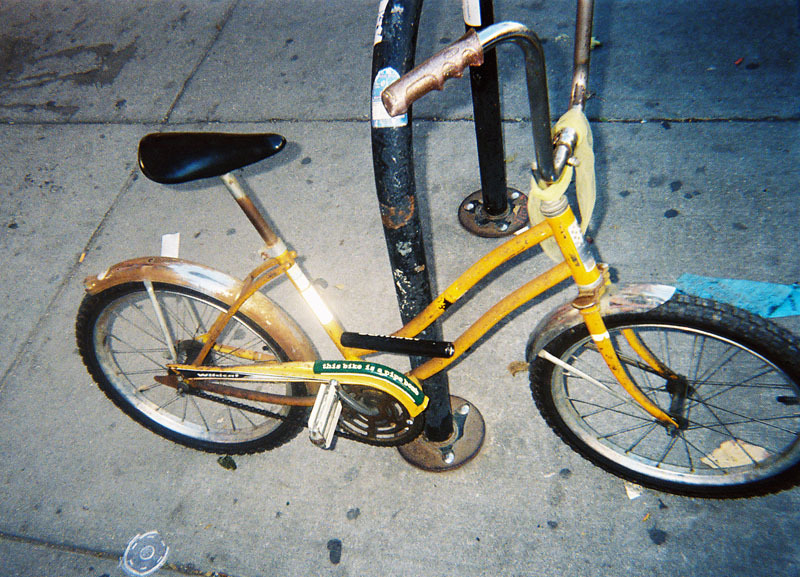 Here's a nifty little funnybike I saw in Wicker Park. Note the This Bike Is A Pipe Bomb sticker, a great cowpunk band from my cousin Frankie's stomping grounds of Pensacola that he turned me on to. They must wonder how many people just come to their shows to get stickers. 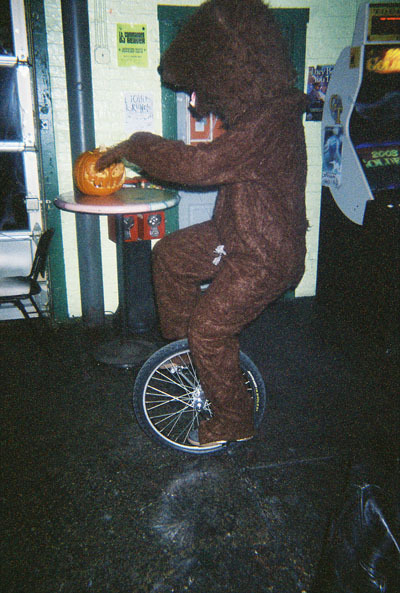 Okay, the unicycle itself is not really modified, but if you're going to ride around on a unicycle dressed like a bear, you're freaky enough for this site in my book. The creator of this bike said it was named "A Work In Progress". He said he just sorta adds things onto it all the time. If you look closely, you can see the big skull up front, the devil duck, and the rear punkin. 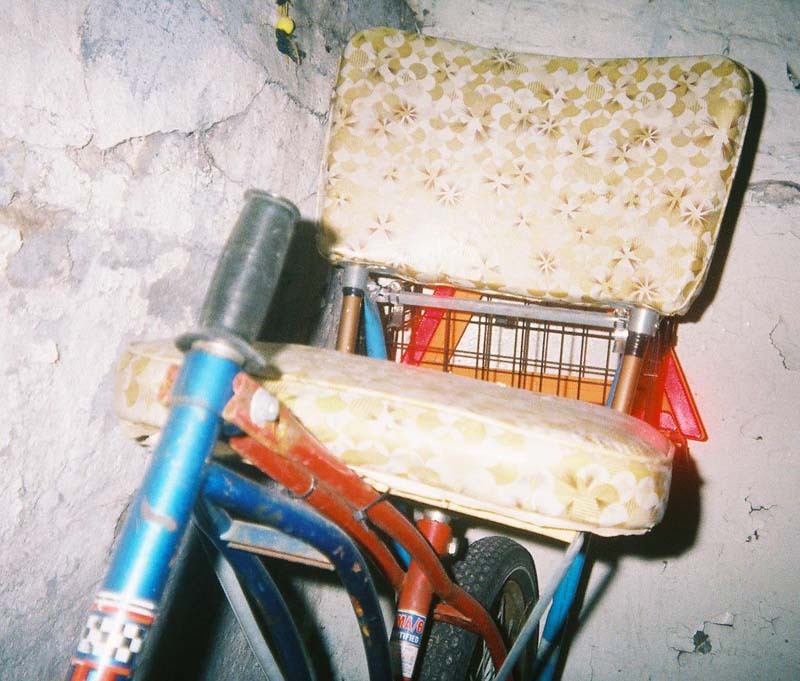 It's covered in little creepy-crawlies, and the overall impression is of a zombie bike. The Rat Patrol needs to recruit this guy. 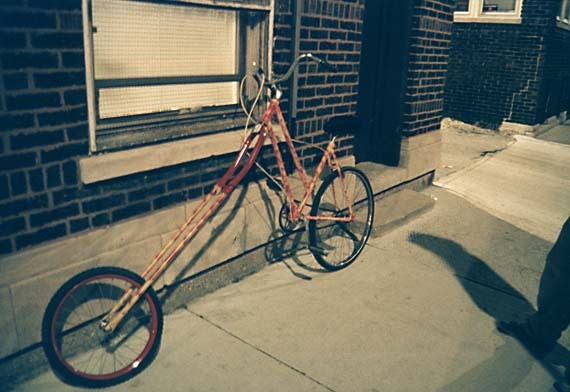 This bike is a familiar sight around Chicago. He calls it "The Chopper". 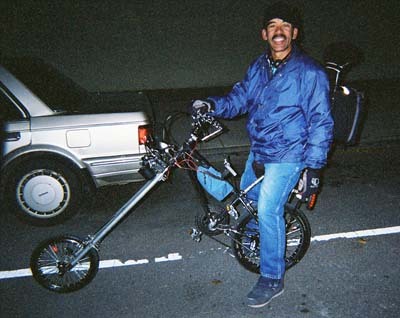 No trailer queen here, this guy rides his chopper everywhere. 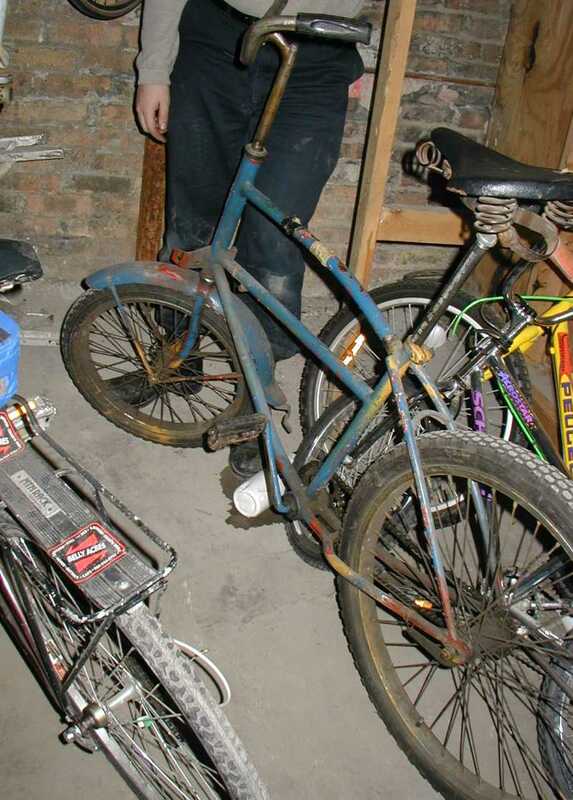 The 10 speeds work and apparently he's mastered riding it with that tiny chain steering wheel. I've attempted it and it's quite challenging. 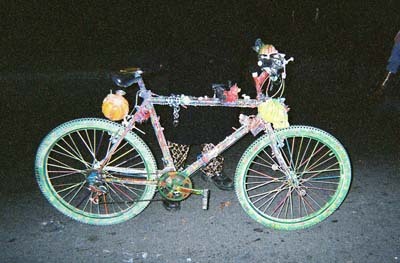 The most striking thing about this bike is that it is covered in lights. You can sorta see the running lights beside the front and rear axles, and the battery in the middle that powers them all. There's a siren, too- which is illegal in Chicago. Fight the power! 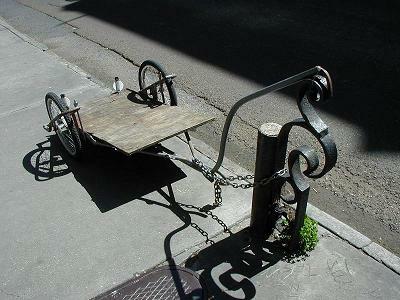 This bike is all bolted, no welding. I believe the four pipes are half-inch steel. Check out the rear-view mirrors.